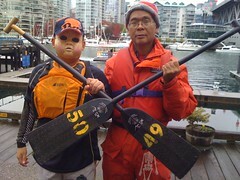 Karl and Steven hold up dragon boat paddles on Halloween Eve Day. Karl paddled with the mask for most of the practice. 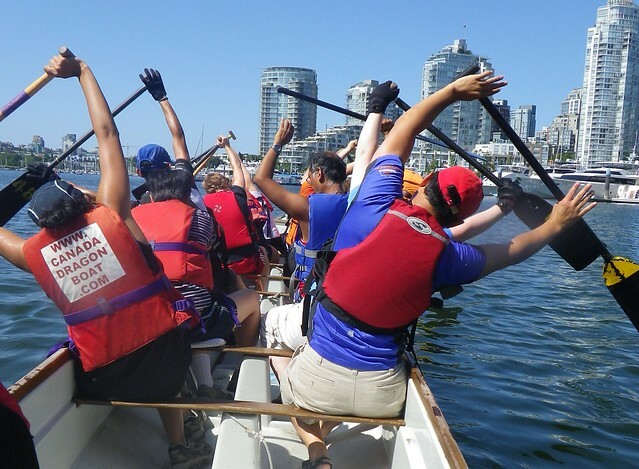 We are continuing to paddle for fun and fitness – on Sundays throughout November. I am also hoping to set up a paddle in voyageur canoes down the Harrison River or Fraser River from Hope to Chilliwack – so that we may see some of the spawning salmon, and the eagles who feed on them. 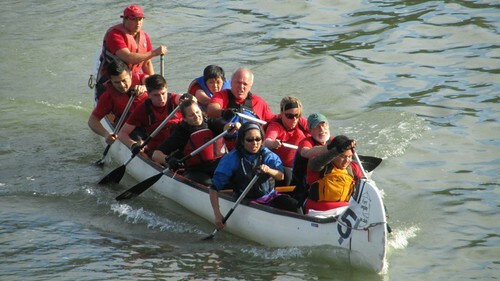 Our last competitve race was on Oct 8, for the Ft. Langley Cranberry Festival Canoe Regatta. But last year some of our paddlers joined me for Day 4 & 5 of the “Paddle for Wild Salmon” down the Fraser River from Hope to Vancouver. It was a 5 day journey to Jericho Beach – and while I started from Hope on Day 1, I skipped day 2 and 3, for work, then returned for Day 4 and 5, from the Katzie First Nations Reserver near the Golden Ears Bridge, all the way to New Westminster and Musqueam First Nations. 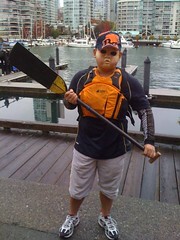 Day 5 we paddled from Musqueam, around Point Grey, and we landed at Jericho Beach. messaged because they didn't want to paddle in the rain or cold. Dragon Zone – GREAT PRACTICE!!! high winds… and if there is a monsoon… but we decide at the time of practice. weather looks rainless for now! 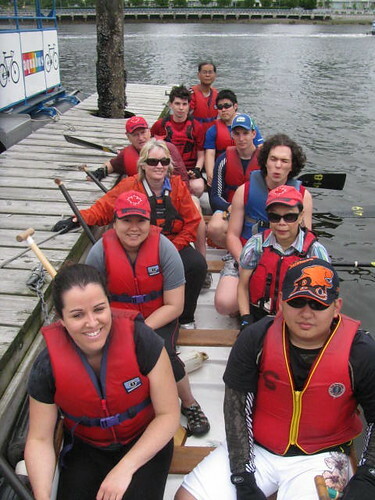 This entry was posted in Dragon Boat Information, Dragon Boat photos 2003, Dragon boat with Todd Wong - Dragon Boat Coach, Gung Haggis dragon boat team information, Main Page on November 4, 2011 by Todd. front row kneeling, Harvey, Debbie, Caroline, Karl. – and very glad we did not end up in C Final. 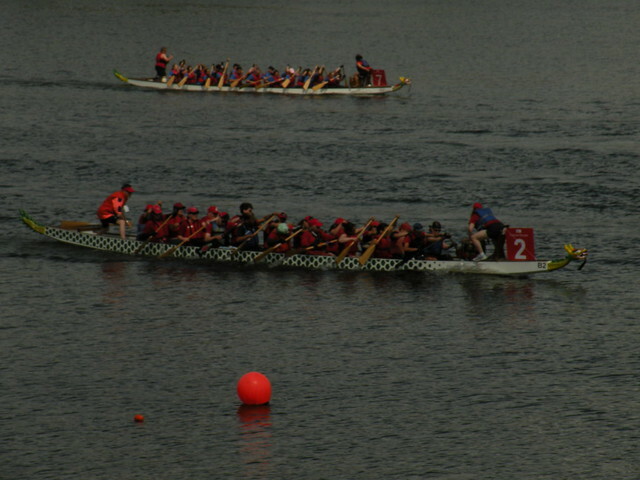 Gung Haggis Fiery Chillis leading the B Final Race after the first turn. We were the first team under the bridge after grabbing our pumpkin. 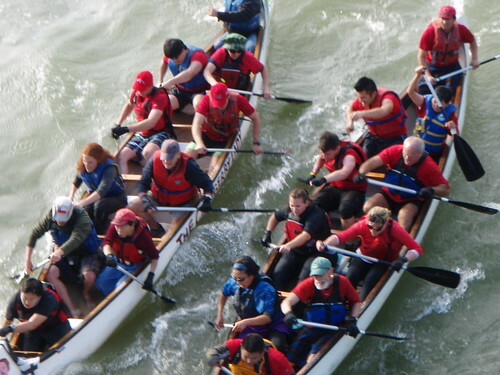 Harvey is steering, Johnny and Maggie in row 5, Leo and Christian in row 4, Sara and Gerard in row 3, Xavier and Keng in row 2, Debbie is lead stroke and captain in row 1. Todd is steering – right side from rear Remus, Aidan, Carly, Michelle, left side paddlers from rear Caroline, Steve, Tracey, Dave – Karl is lead stroke in seat one. 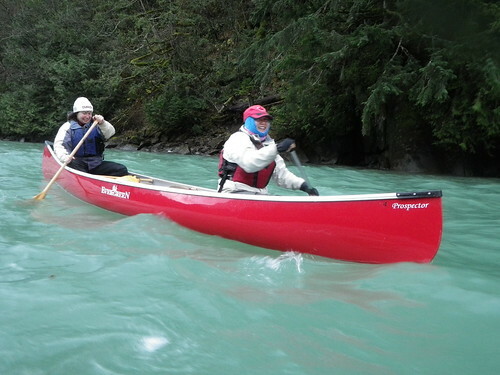 We will keep paddling on Sundays 11am until Nov 13 Remembrance Day weekend. 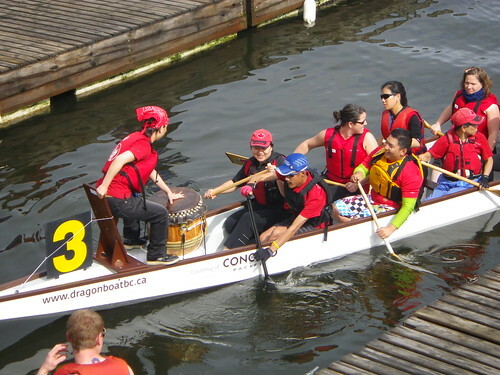 This entry was posted in Dragon Boat Information, Dragon Boat photos 2003, Dragon boat with Todd Wong - Dragon Boat Coach, Gung Haggis dragon boat team information, Main Page on October 9, 2011 by Todd. 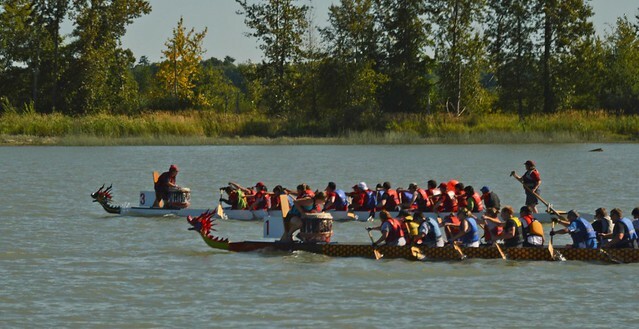 The Ft. Langley Cranberry Festival Canoe Regatta is one of the favorite events of the year for the Gung Haggis Fat Choy dragon boat team. There are no medals. No huge crowds of cheering fans. But lots of cameraderie, and a fun obstacle race. The first two races are double ovals. The Pumpkin Final, is super fun. 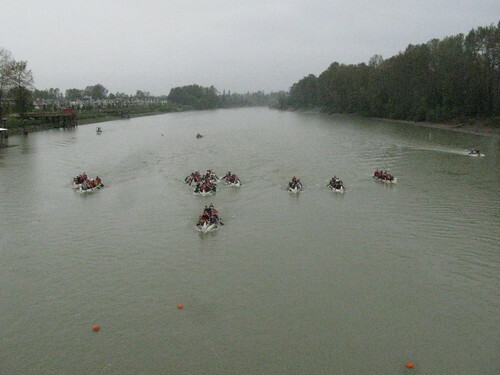 10 boats will line up across the Fraser River slough, then start racing for the bridge. Pumpkins will be dropped from the bridge. Each team has to pick up one pumpkin, then proceed under the bridge. Race 500m up river and make a sharp turn at the buoy marker. Return under the bridge and make a right turn around a buoy on the south shore. Proceed to the North side and drop a paddler off at the beach. 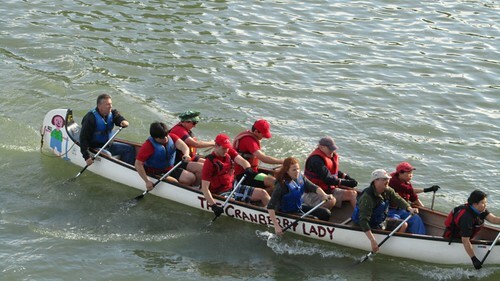 The paddler will balance a cup of cranberry juice, and walk 50 feet up the beach, where they will climb back into the canoe. 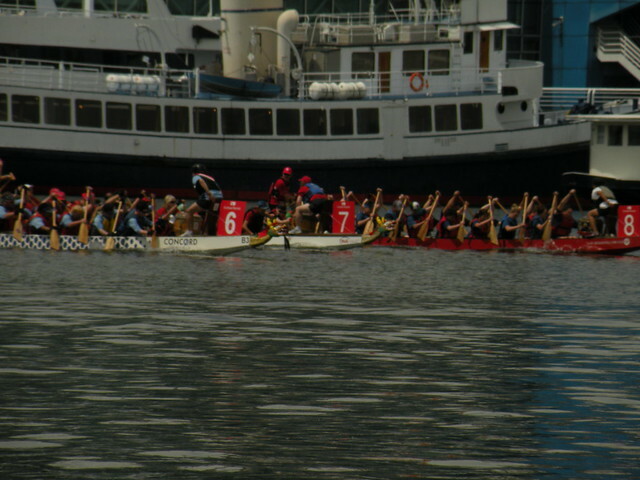 The Canoe travels back around the buoy on the south shore, then heads back under the bridge to the other side to cross the finish line. 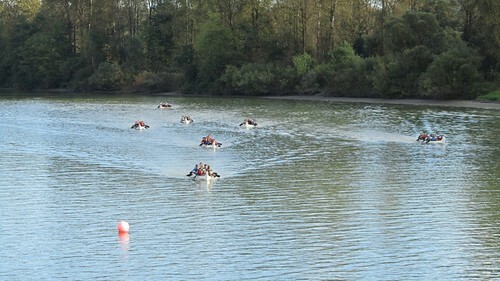 boats, or other boats side by side… doing turns and sprint starts. 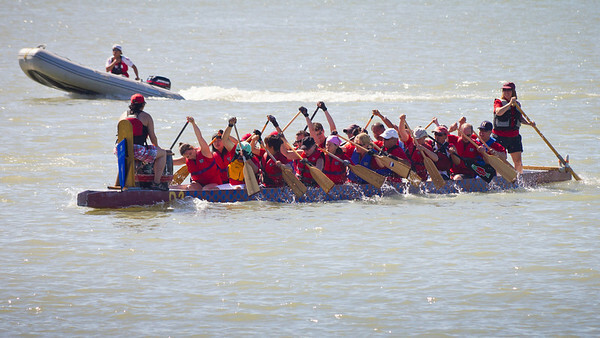 have 12 people on each team – so there will be 2 spares per race. people will do 2 races each, and 6 people will do 3 races each. 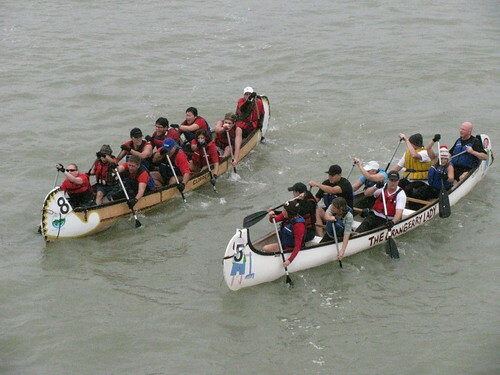 paddle with 8 people and have to do more work. Haggis is #1 on the far side. Watch teams paddle backwards because they missed the pumpkin! turn – a bit wide – but we are in the lead!!! 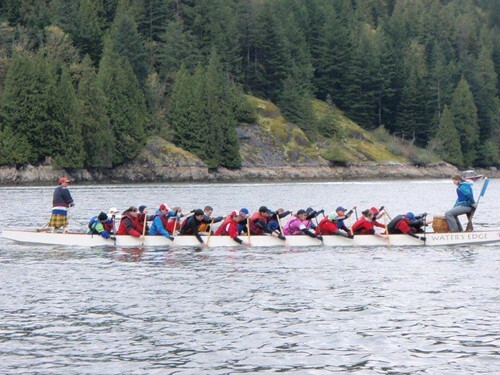 This entry was posted in Dragon Boat Information, Dragon Boat photos 2003, Dragon boat with Todd Wong - Dragon Boat Coach, Gung Haggis dragon boat team information, Main Page on September 29, 2011 by Todd. this Sunday's practice time – September 25th. the shore, at one point. Web sites below for more information. 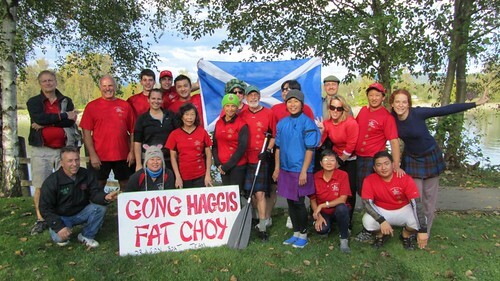 This entry was posted in Dragon Boat Information, Dragon Boat photos 2003, Dragon boat with Todd Wong - Dragon Boat Coach, Gung Haggis dragon boat team information, Main Page on September 23, 2011 by Todd. No Gung Haggis Fat Choy dragon boat team practice this Sunday Sept 18th, neither Steven Wong nor myself is available… logistics are challenging. I recommend going to Coquitlam for the 9:30am Opening Ceremonies. 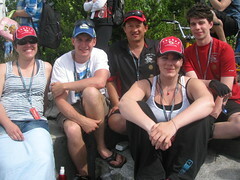 been a Terry's Team Member since 1993.
throughout all of BC. Times vary from 8am start to 10am starts. then taken out on the water for about 45 minutes. Boats depart at 1, 2 and 3 pm on Saturday. with the boat time you’d like to depart. early so you are ready to go out on time! Canada is taking place on September 17th. demos provided by our local community sports groups! invited, no need to RSVP (other than dragon boat)! 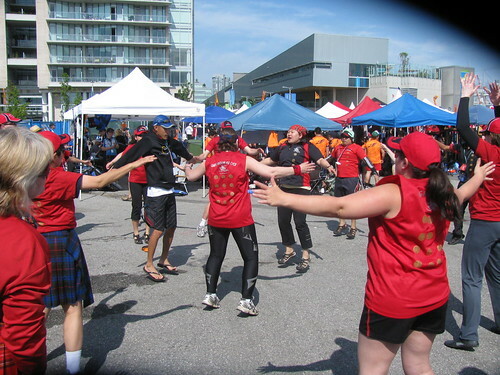 This entry was posted in Dragon Boat Information, Dragon Boat photos 2003, Dragon boat with Todd Wong - Dragon Boat Coach, Gung Haggis dragon boat team information, Main Page on September 17, 2011 by Todd. The original plan was to have them both steer – making for good photo ops. 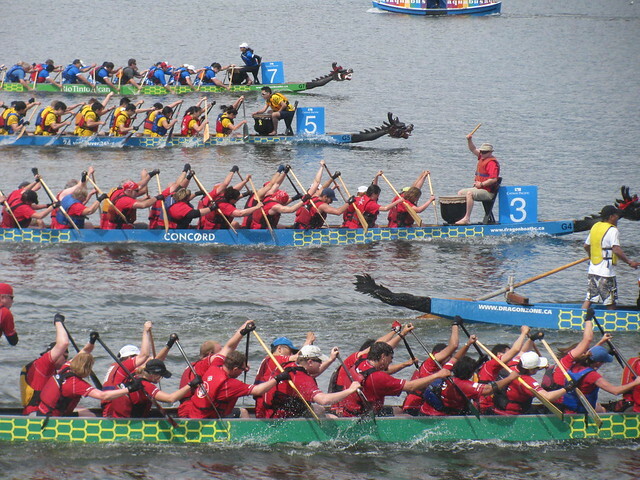 Kate has steered for her own dragon boat team in England. But the weather was a bit choppy, so they both opted instead to paddle. 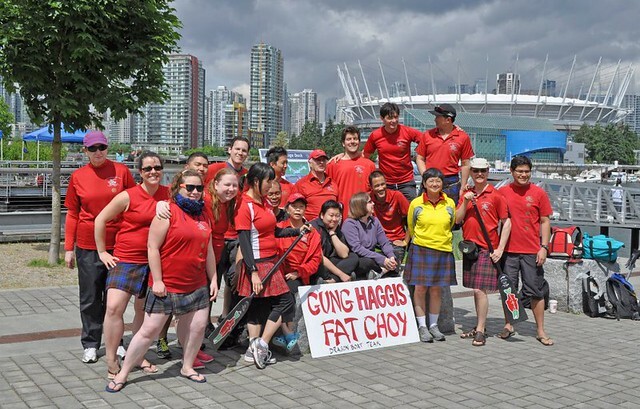 This entry was posted in Dragon Boat Information, Dragon Boat photos 2003, Gung Haggis dragon boat team information, Main Page on July 5, 2011 by Todd.